A new space to hang and display my favorite frocks, jackets, blouses, shirts and accessories. I found this amazingly shaped branche lying at the side of to the road in Brussels. I took it all the way back to my home in The Netherlands, painted it white with regular water based wall paint(latex) it turned out lovely and matte. 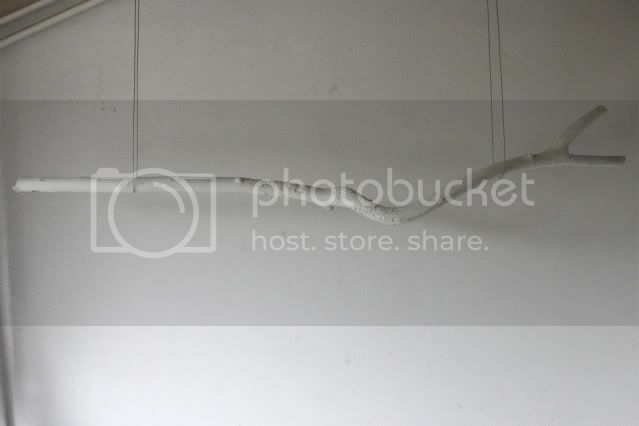 Then I hung it between two metal wires that I attached to the sealing with hooks and... Voila! A new storage solution! thanks for the comment... you seem like the greatest im now following! Wow!!! You have such a grate idea!!! wow, amazing! crafty I'd say :) love it! echt heel vet die tak zo! Okee, dit is gewoon simpelweg BRILJANT! :) Echt amazing, girl! I like your blog. Hope you will become a follower of my blog too? Are you interesting in following each other? That's the coolest thing I've seen all day!!! Wow you're super super creative! I love this idea, I give you props my friend! heel leuk! ik wou dat ik daarvoor de ruimte had in mijn nieuwe woning. love this! great blog too. holy crap. you just gave me my trunk show prop idea, hah and i also kinda want this in my room like tomorrow. already have a branch picked out an all. you'd be so proud. thanks for this amazing idea! i've seen this in a store display once and thought, how cool! you are so genius! i love it. i wish i had enough space in my room to put one up. oh my god. i am COMPLETELY in love with your blog! 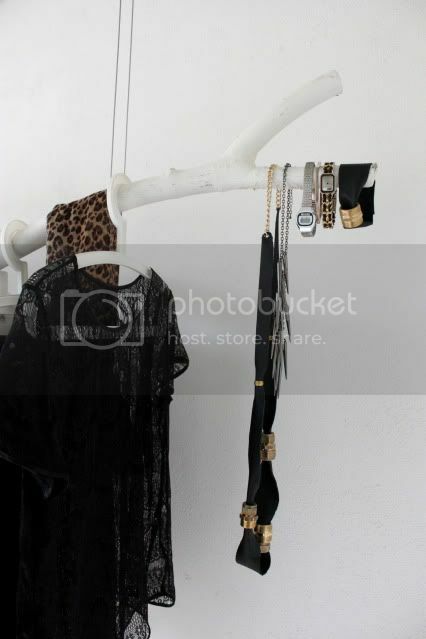 you're so creative, who would have thought to use a branch as a clothing hanger?! i love all your DIY stuff, definitely need to try it out sometimes :) thanks for sharing. and obviously following!! I want it too x.x !! What a fantastic idea, I adore this! I wish I had the space to recreate something like this. i am totally inlove with this. how cool is that? !i love it! Awesome! So creative, you did such a great job. Wow dat is echt super gaaf! vind jou blog echt leuK! what a wonderful idea. this goes straight into my inspiration folder. Thats a really great idea. this is beautiful! I adore it. I also envy you for thinking of this first! Genius!! Dat wil ik ook! such a wonderful idea, soo sooo cool! So that is mad insane. I definitely want to incorporate that into my room... somewhere... amongst the clutter. Very nice! Edgy and spare. I often decorate with tree logs, until they end up in a fire. :P They make good stools. I've been wanting to do this for such a long time! Ohh wooooww! Mooi :) Ik hoop dat ik ook tegen zo'n tak aan loop, nouja.. Niet letterlijk, haha. wow this is so rad! amazing and beautiful! What an incredible idea! Even those hangers are perfect! SOOOOOOO COOL!! I need to do this, brilliant! This is so innovative! Love your blog- and thanks for the cuper-sweet comment! LOVE this! What a genius idea, thanks for the inspiration! What an amazing idea! Love that you brought nature into your home. Best eco-friendly clothing rack ever! wow! wow! WOW! this is amazing! thank you sooomuch for the idea! I am going to be walking around looking for a branch just like this one now, I need to have this in my room. Wauw dat ziet er ontzettend mooi uit!! Great idea! It looks fabulous =) You have a new follower =) Take a look at my blog and if you like it, follow back? Wow.... What an idea! Beautiful! I'm so glad you commented on my blog because now I have found yours and I absolutely love it! This one is going straight into my bloglovin'. 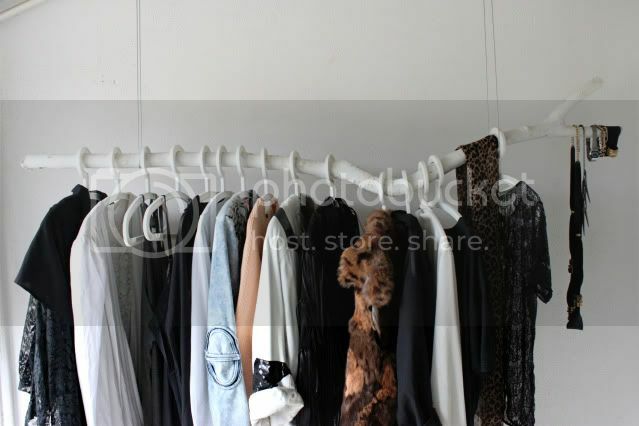 This branch clothing rack is an amazing idea, and you have executed it so well. Looking forward to more brilliant posts from you! Wow geweldig! Wil ik ook!
. love the idea!! i need one, too! i must not forget. OMG!!! This is FREAKIN' BRILLIANT!!! Wow, COOL! 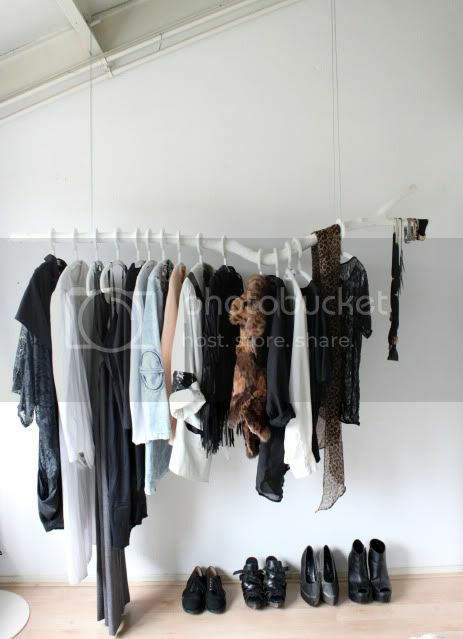 I've always thought that if I had my own clothing store, I'd hang the clothes on branche clothing racks. wow!! That is an impressive and clever idea. wow! this is REALLY pretty! i hope i can find something like that too! Wauw, wat geweldig gedaan! Echt heeeeeeel mooi. I love your idea of using a branch. Excellent. OH MY GOD, THAT IS FANTASTIC!! I am so saving this picture for when I have a home with enough room to do this. Thankyou! Wow I just discovered your blog and it is AWESOME!!!! LOVE it!!! i absolutly ADORE this, and plan on doing it in my next room! GORGEOUS! I love this so much. Thank you for sharing. I am living in a bedroom without a closet. It is a beautiful and fairly large room. This is an absolutely beautiful idea. Yours is lovely. I can't wait to try it out myself. oh my, this is just pure genius not to mention aesthetically pleasing! Mind if i try this meself? this is so shabby chic and at a very affordable price.. loveee your thinking! I love it, very artsy! Muito criativo ! beautiful !!! Ik ga dit zeker en vast ooit eens proberen als ik mijn eigen appartement heb. Kon ik het nu al maar doen :). This is great! I am posting about it on DecorHacks.com next week. wowwww, you are so so so creative! Heeel slim, mooi en economisch. What a great idea, this is not that hard to make it, we can make it our own too. Good thing about this hanger is that you can hang many clothes and even you can hang watches, belts and many other things on it. At last! I found a good post like this.. Thanks for this informative post! By the way, can you write a post about ning seo factors? Thanks again! Thank you for sharing superb information. Your web site is very cool. I am impressed by the details that you have on this blog. It reveals how nicely you perceive this subject. Bookmarked this web page, will come back for extra articles. You, my friend, ROCK! I found simply the info I already searched all over the place and simply couldn’t come across. What an ideal site. A lot of times, a tumble dryer just doesn't work well enough. In fact, the clothes you dry in your tumble dryer can even get damaged because of the means of drying. A little imagination goes a long way. But you also need the think logically. You would have to dry out the branch first for at least 12 months for it to retain rigidity. Not to mention getting rid of any creepy crawlies! Eeeeeekk! This is so beautiful, hope you don't mind but I've put one of the pictures on my blog. Obviously I've credited you and linked the image back to your site. Thank you for this treasure trove. I honestly think it’s one of the best I have read online. I’ll check your blog later for updates and the latest development. There are so many different aspects when it comes to this topic. Thank you so much for sharing your knowledge on this particular aspect.